BATON ROUGE — With four new members, the Metro Council has a new look and new leadership. At its first meeting, the Council unanimously elected second-term Councilman Chandler Loupe as Mayor Pro-Tem, the No. 2 position in City-Parish government. his race to unseat the Mayor-President, Kip Holden. During the past four years, the relationship between Holden and the Council was strained, but now Loupe says the relationship has been “re-set” and the Mayor and the Council are working well together. He gives a lot of the credit to William Daniel, the City-Parish’s Chief Administration Officer, whom Loupe says is working hard to keep the Council well informed and bring the Mayor-President and the Council closer together. Amoroso replaced Walker, who was term limited. Delgado defeated Metro Councilman Smokie Bourgeois. Ryan Heck, who was unopposed, replaced Alison Gary, who did not seek reelection. Chauna Banks-Daniel replaced Ulysses Addison who was term limited. The previous Council was split 6-6 along party lines. The new Council has a 7-5 Republican majority, after incumbent Councilman Trae Welch switched from Democrat to Republican. All seven Republicans are white males, while all five Democrats are black females. Loupe said he doesn’t expect party politics to play much role in Council decisions. “Party doesn’t really come into play in decisions of a city council, or at least it shouldn’t,” he said. “I’m more worried about the boys versus the girls!” he laughed. Loupe was elected Mayor Pro-Tem unanimously and said he doesn’t really foresee major divisions in the Metro Council. That thought was echoed by newly-elected Councilman Buddy Amoroso, who praised Loupe’s approach to Council business. “There’s a spirit of cooperation that was lacking the past four years,” he said. Amoroso, who also supported Walker, said he had met with Mayor-President Kip Holden, and they agreed to work together. Like Loupe, Amoroso said William Daniel, a former state legislator, has been key to bringing everyone together. Amoroso said he was pleased with some of the Council’s early decisions. They passed an ordinance he sponsored to exempt individually-produced computer software from the sales tax. He has already been contacted by a California software company with a small office here that now wants to expand their local operations. Ironically, Chandler Loupe almost didn’t run for reelection last year. After his son Chandler Jr. was seriously injured in a shooting, Chandler Sr. devoted a great deal of time to his son’s recovery. “If I had been opposed for reelection, I probably would not have run for another term,” he said. Fortunately, at the end of qualifying, he was unopposed and didn’t have to face a campaign. Although the media didn’t realize it, Chandler said he has had commitments from a majority of the Council for the Mayor Pro-Tem post for several months. 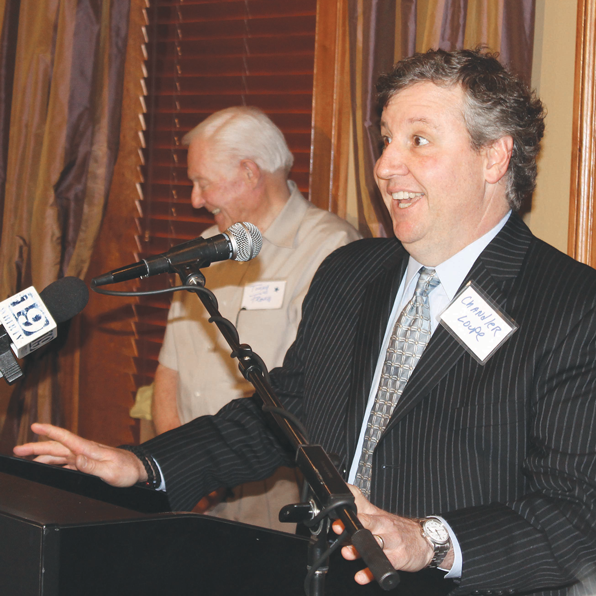 Loupe is a lifelong Baton Rougean who attended St. Aloysius and graduated from Catholic High. He met his future wife, Mimi Palfrey, when she was a student at St. Joseph Academy. Mimi is the daughter of the well-known physician, Dr. William Palfrey, who passed away recently. Chandler and Mimi will be married 25 years in August. They have three boys. In addition to Chandler, Jr., who is a junior at LSU, son William is a student at the University of Colorado, and son Thomas is a student at Christian Life. Chandler earned his B.A. and M.B.A. from the LSU School of Business and his Juris Doctor degree from Tulane. He has practiced law for 22 years. He handles a lot of environment law, representing both plaintiffs and defendants. Beyond crime, quality of life, and education, Loupe said the sewer system is becoming a more and more important issue. Loupe is an artist who works in acrylics, and he loves to go fly fishing. He enjoys history and has read biographies of most of the Presidents. Unfortunately, with all his new responsibilities, the new Mayor Pro-Tem may have a lot less time for some of the things he enjoys.